A quick and easy supper when time is of the essence! Heat the olive oil in a pan and add the sausages. Fry for about 8 minutes turning occasionally to ensure an even golden coat and cooked through. Remove the sausages from the pan and cut diagonally into bite size pieces. In the same pan add the garlic and pour in the chicken stock, boil until it has reduced by half. Stir in the tomato puree, tinned tomatoes and oregano, season to taste. Simmer for approximately 15 minutes until the sauce has thickened. Add the sausage pieces to the sauce and gently simmer. While the sauce is cooking, cook the spaghetti in a medium sized pan of lightly salted water as per pack instructions. Drain to remove the excess water. 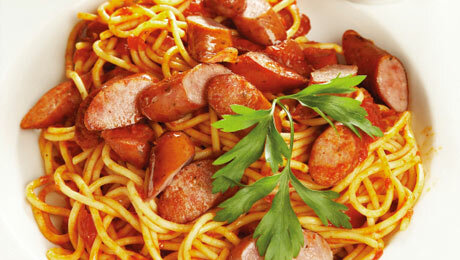 To serve, place some spaghetti in a bowl, spoon over a generous serving of sausages and sauce. To make it extra spicy, add a chopped red chilli as you fry the sausages!